All your tech. All the time. This is Total Tech Support. A membership dedicated to supporting ALL the tech and appliances in your home — no matter where or when you bought them. Get help in store, over the phone and 24/7 online. We're here to answer your questions and help you use all your devices. Total Tech Support also includes many computer and connected car services at no additional cost, and it gives you big savings on standard in-home services, repairs, and most Geek Squad® Protection and AppleCare plans. FeaturesWe'll Support All Your Devices The heart of Total Tech Support gives you unlimited support for all your tech and appliances, no matter where or when you purchased them. We can help you in store, over the phone and 24/7 online. We've Got the Answers Overwhelmed with the new tech devices in your life? We're here to answer your questions and help you use all your devices. We can help with computers, home theater, smart home, connected car, appliances and much more. Many Computer Services Are Included There's no additional cost for many popular computer services, including PC Virus Removal, Data Transfer & Backup, and Computer Setup, when these services are performed in store or remotely. Many Connected Car Services Are Included¹ There's no additional cost for most car installations, including Remote Start Install, Backup Camera Install, and In-Dash Stereo Install. Only $49.99 for In-Home Services² We'll come to you for only $49.99 per service. Choose from standard installation and services like TV Mounting, Home Wi-Fi Setup, Dishwasher Install, Smart Doorbell Install and many, many more. 20% Off Repairs and Advanced Services³ We’ll handle the tricky stuff, including major appliance repairs, wiring your security cameras, and mounting your TV over a fireplace. 20% Off Geek Squad Protection and AppleCare⁴ Save 20% when you add protection to your new products, including accidental damage from handling coverage for many devices. Internet Security Software Is Included Help safeguard against viruses, ransomware, malware and cyberattacks. Your included software is good for up to three devices in your home. Membership Dashboard and Best Buy Home App Get easy access to your benefits, appointments, list of devices, warranty plans and more. Plus, you'll have one-touch access to a Geek Squad Agent. Terms and Conditions Total Tech Support membership is subject to complete Terms and Conditions. 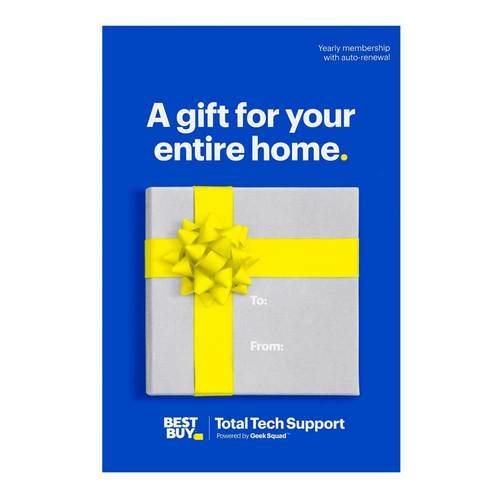 A My Best Buy® account is required, subject to the My Best Buy Program Terms. This membership (with internet security software included) renews automatically each year. The customer's chosen card will be charged $199.99 plus tax, or the then-current price, on the customer's yearly renewal date unless the customer cancels before then by calling 1-888-BEST BUY (1-888-237-8289). Best Buy will send the customer advance notice of membership renewal to the email address the customer provided, including notice of any price change. 1. Any vehicle-specific parts or accessories needed to complete an installation or setup will be charged at regular price. 2. Fees for any necessary parts, accessories, or permits will be charged in addition to the $49.99 for each standard in-home service. Also, a trip charge may apply for travel outside of metro areas. 3. 20% off repairs and advanced services applies to labor only. 4. 20% off Geek Squad Protection and AppleCare Protection Plans does not apply to monthly paid plans, renewals, and plans with loss and theft insurance.